A couple of weeks ago I was craving a salad, full of the sharp and sometimes bitter “weeds” and wild plants of spring. 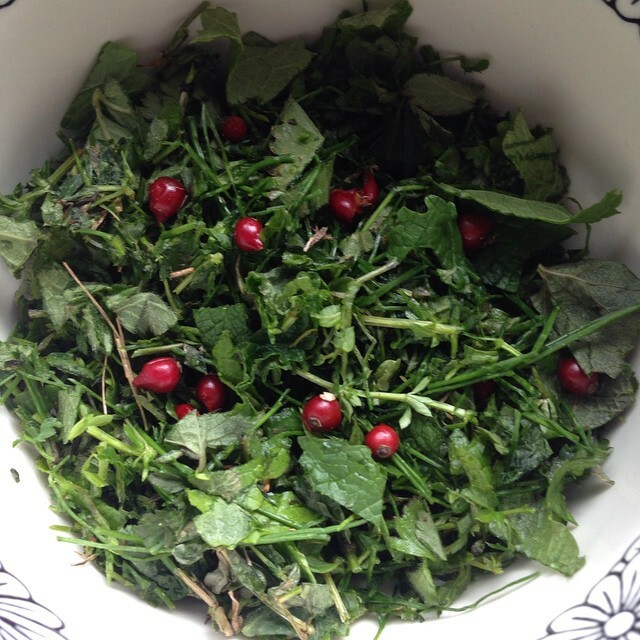 And while there was a little bit of snow on the ground and ice on the waters, I was confident that I could find enough wild greenery that wasn’t frost-bound to make a salad. Make no mistake, this wasn’t a survival exercise. I just wanted a nice salad, to complement my more traditional wintery offerings of dried and preserved goods and winter produce. This was a useful test of winter foraging skills. Not only did I have to remember where certain winter greens and herbs grew, I had to think of areas in which they wouldn’t be covered in an inch or more of snow. They would still be perfectly edible, but water-logged and wilted. It was a challenge to my memory of not only wild plants but the landscape around them. I needed perimeters, areas where there was a either shelter from or drainage for the snow. I had to do a bit of looking, but first I had to do a bit of thinking. I found tiny cleavers (Galium aparine) and patches of chickweed (Stellaria media) peeking their way up from an old field where long dried pieces of last years overgrown grasses provided shelter. Around the bases of trees and other well-drained spots in the woods crept garlic mustard (Alliara petiolata) and the mild leaves of mock strawberry (Duchesnea indica). In my own yard in garden vegetable rows were hairy bittercress (Cardamine hirsuta) and, poking up above the snow and perfectly crisp, field garlic (Allium vineale). Fresh, tiny rosehips made for a perfect garnish, the whole thing being simply dressed with a pinch of salt, some olive oil and just a bit of vinegar. The salad was delicious, the exercise (in both senses) invaluable. Sometimes it’s worth the extra effort to discover something beautiful in the snow. 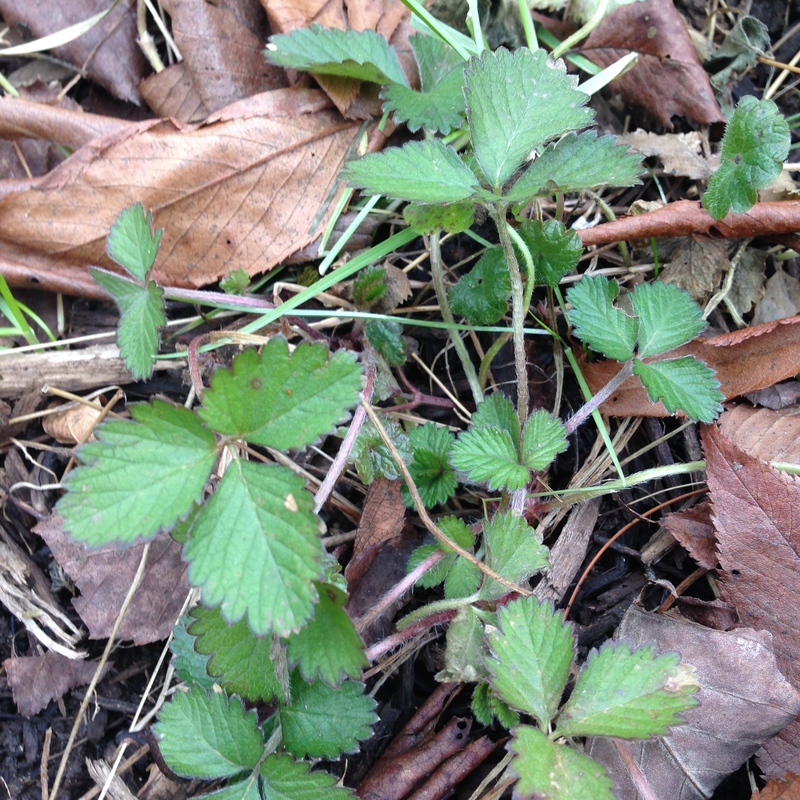 As a child I used to gobble the “wild strawberries” that, then as now, popped up in our lawn and mulched beds alike. Sure, they didn’t taste like much but they were a pleasant nibble. Perhaps more caution was in order, but the darned things are so inoffensive looking that it would be difficult to suspect them of being hazardous. Older and slightly wiser, nowadays I don’t tend to eat anything without being quite careful about it. In the grocery store, one examines a package. In the wild or the backyard, one makes sure to clearly identify a plant before consuming it. 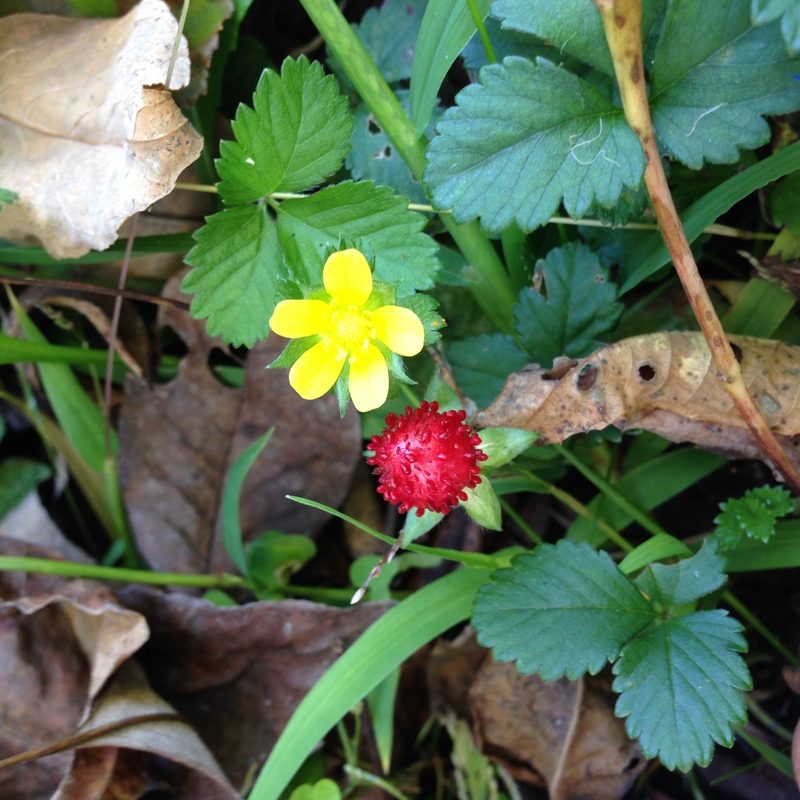 These wild “strawberries” were of course not true wild strawberries (which are far from flavorless) but the invasive, pernicious ground cover known as Potentilla indica or Duchesnea indica. The confusion over classification is a recent one and Duchesnea is still mainly used. Potentilla seems to be the more accurate fit (though I am hardly a botanist), since that genus contains the cinquefoils whose leaves are used in very much the same way as those of mock strawberry. Leaves? That’s right. For years and years I have eaten the charmingly inoffensive fruit of the mock strawberry without realizing that the far more interesting and useful part of the plant was staring me in the face. The leaves are an excellent food and tea, tasting faintly of cucumber (with a hint of sage) and widely available for almost the entire year. For years I have let this plant grow wild in my yard and planted beds for the simple fact that it is harmless and excludes other, non-useful weeds. Now? I will definitely encourage its’ growth and use it whenever necessary. Which, honestly could be often–the only plant that grows more prolifically in my yard in the off-season is ground ivy, equally edible but quite bitter once springtime has ended. So what about those fruits? Many find them banal or insipid, but I consider that a judgement based more on its flavor in comparison with other wild berries or with commercially cultivated fruit. Another common observation is that they taste like watermelon bitten very close to the rind. That rings true to me, and also implies the thing I do really like about mock strawberry, which is its’ pleasing texture. Too often we are disdainful of things which have mild or inoffensive tastes. I have a feeling we would be less disdainful if we did not have such a surplus of food. Then we might be quite pleased to have a plant which is edible in the Northeast in one form or another for almost the entire year. When we forage we learn a lot of lessons about plants and our relationship with them. Mock strawberry is a good example : as much as we might despise this little scrubby ground cover, we can potentially (no pun intended) learn from it and its’ ways. Sometimes the best and most useful plants are those which we most ignore. I have always tolerated and sometimes enjoyed mock strawberry as an invasive plant which excluded far more annoying weeds. Now I just might let it run riot, and delight in the free surplus of winter greens and summer berries. Insipid? Maybe. But when you’re starving don’t come over and scoop up my “mock” strawberries. I’ll still be enjoying them, tasteless or not.